Live Spark got a nice mention by Greg Schwem both on Huffington Post and in The Chicago Tribune. Original articles are here (Huffington Post) and here (Chicago Tribune). More information on Greg here. We have to add--the actors behind the voices of our AniMates (who interact in real-time) most certainly need dressing rooms and their share of the "bird seed". Whenever I have my children's full attention, meaning they are only performing two simultaneous tasks on their cell phones, I attempt to offer fatherly advice on subjects ranging from drugs to fashion choices to not spending money like a Kardashian. So far they seem to be listening, although I know the day is coming when one bursts through the front door and excitedly screams, "Dad, don't you think this tattoo will be perfect for my job interview?" Recently my eldest and I were discussing her chosen college major, physical therapy, a vocation that I wholeheartedly support for it meets the criteria I laid out during one of my advisory sessions: Do not choose a career that can be replaced by a computer. Physical therapist has only a 2.1 percent chance of becoming automated in the next decade or two, if one is to believe "The Future of Employment: How Susceptible are Jobs to Computerization," a 2013 study authored at the University of Oxford. Budding fashion models take note: The study predicts a 98 percent likelihood that robots, not humans, will be sashaying down Parisian runways in 2033. Now, I fear, I may be searching for a new line of work, having just lost an employment opportunity to a parrot. And a computerized one at that. I always assumed my longtime profession - stand-up comedian - would forever be immune to virtualization. "Comedian" doesn't even appear in the Oxford survey. And besides, I tell my children, "Nobody is going to sit in an audience and laugh at a machine." Of course, that was before presidential candidate and automaton Ted Cruz garnered some yuks at the last GOP debate, but I digress. "Sure, robots can build cars, cook gourmet meals and fill orders for cholesterol medication at the local pharmacy. But tell jokes? Nonsense," I said smugly. Not so fast, as I discovered upon contacting a client who had hired me several years ago to perform live, human generated comedy at an annual meeting for a large, independent optometry network. At the event's conclusion, accolades of "great job," "funny stuff," "stay in touch and "we DEFINITELY want you back" poured in. Last week I contacted the client, eager for him to make good on his promise. The original contract was on my computer screen; all it needed was a new date and maybe a slightly higher performance fee. Even comedians are not immune from the ravages of inflation. "Actually, Greg, we've been using a parrot the last few years," the client replied. "What kind of parrot?" I asked, as if losing a gig to a scarlet macaw as opposed to a green-cheeked conure would provide me with some comfort. "It's an animated character," the client said. "I'll email you a link to the company that created it." "But, but ..." I stammered. I remembered another piece of advice I consistently give my children: Always stand up for your beliefs and your skills. This would prove difficult, knowing my competition didn't require a plane ticket, a king-sized bed at the local Marriott, meal per diem and a taxi ride to and from the airport. Out of curiosity, I clicked the link. The parrot was the brainchild of Live Spark, a Minnesota-based event production company and creator of "AniMates," computer generated characters that can humorously interact with audiences in real time. Live Spark President Dan Yaman was happy to talk with me, once I assured him I wasn't calling to name him - and his parrot - defendants in a wrongful termination lawsuit. "We have a talking horse, talking eagle, talking building; basically whatever you can slap a face on, we can animate it," Yaman said. Heavy hitter companies including Intel, MetLife, Target, Pfizer and Xerox have used Yaman's creations at live events. "(AniMates) can talk about things on the audience's mind. They can even challenge the CEO," Yaman said. But, he reminded me, AniMates are controlled entirely by creative human beings who sit backstage, generating the funny lines and controlling the character's movements. "Let's talk next week," Yaman said to me. "Maybe we can work together." And with that, Yaman reaffirmed yet another piece of grandfatherly-sounding advice I've bestowed on my kids: When one door closes, another opens. Even if the object behind that door is a brightly-colored bird that doesn't need a dressing room. You Won't BELIEVE What Live Spark Has Been Up To! And we're going to show you... in a SONG. Watch this quick video update and get some ideas for your next event that will BLOW YOUR MIND! Sorry for the sensationalistic subject line. It's so very click-bait. But we wanted to make sure that you saw what we’ve been doing. From event design to game shows, to animated characters and teambuilding…we’ve had a lot going on. For case studies, videos, and more, check out our website— www.live-spark.com/results —and contact me at dan@live-spark.com. Important news from Live Spark! We would like to take a moment to introduce you to our new Vice President of Business Development, Kristina Gooding. 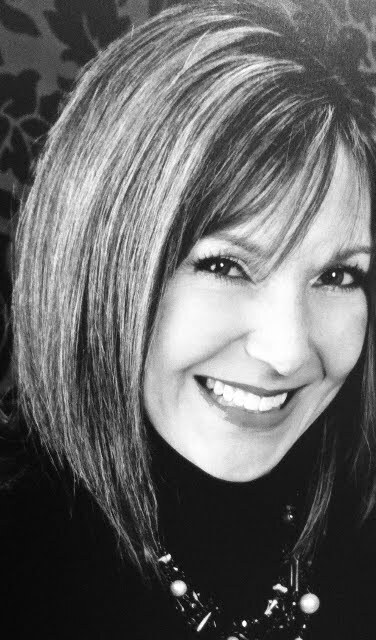 Kristina has a stellar sales, marketing, and meetings & events background. She has over a decade of experience putting words into action in the meeting and convention industry; where she has designed and produced interactive events for a multitude of Fortune 1000 companies. We are excited to have such a passionate, dedicated person as a part of our team. Kristina has keen insight, an unwavering dedication to customer service and a knack for delivering highly effective events. Kristina will be a huge asset to our clients and we look forward to having you meet her! 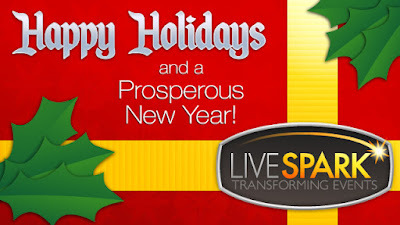 Happy Holidays from all of us at Live Spark. It's been a challenging year, in some ways, for the event industry. By and large, companies scaled back on travel--and this included large, live events. However, it didn't stop meetings altogether. With the recession, companies had more reason to get their people together; to boost morale, get everyone on the same page, realign the team, direct employees towards common goals, etc. What ended up happening was that companies shifted their focus from the big and glamorous elements of a live event (lighting, fancy staging, bigname entertainment, etc.) and started focusing on what was really important: the message. It was with this renewed focus on the effectiveness of a face-to-face event (no matter how large or small) that we were able to help new, current and past clients develop events that truly had an impact on their organization. We didn't just work harder--we worked smarter--and it was our clients who pushed us to new heights. Thank you for continuing to challenge us to come up with new, creative and innovative solutions. Thank you for your feedback, support and business. Most of all, thank you for being a part of the Live Spark family. As we head into the new year--the busiest time of year--we look forward to what is ahead. To new creative developments, to new faces, to new solutions and new audiences. We've been Twitterpated (to use a line from the movie "Bambi"). Live Spark is now on Twitter. We'll be posting exclusive updates on projects, news pieces, tips and more--all in 140 glorious characters.